Another little combination post. Jackfruit is a fickle friend. In the right hands it can be made awesome, but sometimes it just falls flat. 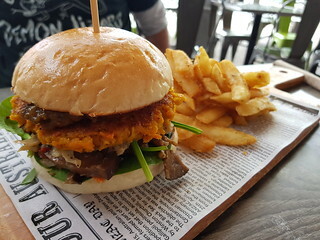 Jackfruit in burgers is definitely a trend at the moment, and I don't mind at all. 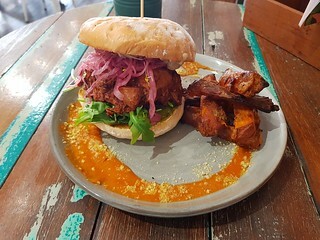 A good BBQ jackfruit burger is a delight. Here are two I tried, from two very different places. I've been to Brewski a couple of times before, it is less than 10 minutes walk from my work, or an even shorter drive. The menu there runs the range from omnivore to vegan, so it is a good place for mixed groups. It is a bar, with a large beer selection if that is your thing. 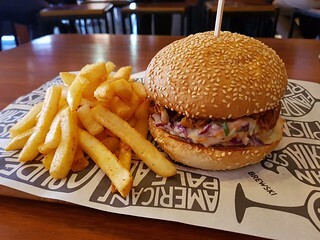 The last time I went (on a Tuesday for their $10 burger special), they had changed the menu a bit and introduced their Pulled Jackfruit Burger: Stout infused & applewood smoked jackfruit, rainbow slaw, and smokey BBQ sauce on a maple toasted bun. It was so good! Though very messy, as these things tend to be. But I loved the flavour on the jackfruit and the crunchy slaw. With some fries on the side, of course. I highly recommend. By contrast to the Brewski pub vibe, Miss Bliss is a 'wholefoods' cafe in West End. 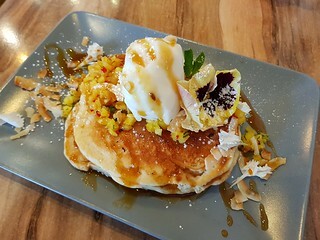 Again, this is not all vegan, but always has some sweet and savoury vegan options. I've been there once before. Each menu has a Herbivore Burger, and this was the version from earlier this year. They have since changed the menu, and I cannot remember all the particulars, but I feel that it had a mushroom, rocket, jackfruit, pickled onions, and aioli. Served with some sweet potato fries. It was OK. The jackfruit here was in bigger chunks, and was just kind of tomato-ish and didn't have a huge flavour. It was a nice enough burger, but clearly came in second place in this story. I also had a Pumpkin Spice smoothie while I was there, which was fun. I'm afraid I can't remember exactly what was in it... pumpkin and spices I imagine! 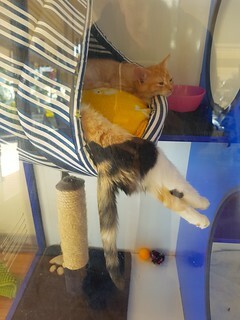 A follow on from the silly adoption kitten series. I love The Abundance Diet by Somer McCowan. I love the focus on fresh vegetables, and Somer's recipe for gooey melty cheese is so quick and easy and tasty, you will love making it. You can see what else I have blogged from this book here. 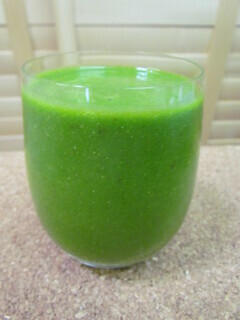 Annie's Da Cherry Bomb Smoothie: The book has a lot of green smoothies in it, so I will just highlight a few in each post. This one is a bit more brown than green, thanks to a whole lot of delicious cherries. This also has a hefty dose of cinnamon in it, which I love. Somer suggests using stevia to sweeten in all the smoothies. I rarely use any sweetener, as I find the fruit sweet enough. Also I would never use stevia, as I don't like it. This was lovely without anything added. 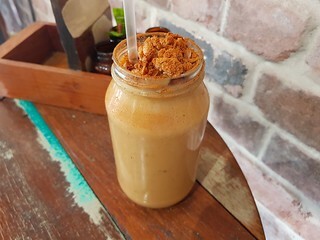 Ginger Zinger Smoothie: One of my favourite juices is carrot, ginger, and apple... and this is a green smoothie version of that. 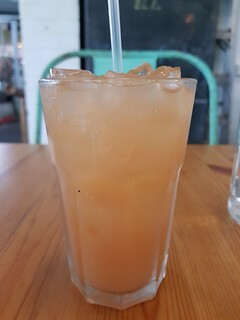 It calls for carrot juice, which is super hard to find here, so I did use some bottled carrot/ginger/apple juice instead. But it is also made creamy but adding silken tofu, oat milk, banana, and peaches. Plus a ton of ginger! I left out the flaxseed and the sweetener. This was very filling. 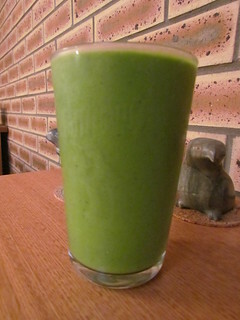 Island Bliss Green Smoothie: This is well named, and is very tropical! Based on coconut water, it is a refreshing drink. I used all spinach for the greens instead of spinach and kale, because I just rarely like kale in smoothies. My mixed frozen tropical fruit blend had mango, honeydew, pineapple, and strawberry in it. Definitely no need to any sweetener with that blend! I used some LSA blend rather than ground flax. 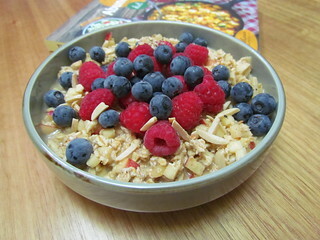 Apple and Chai Spice Muesli: I love chai, though tend to avoid the caffeinated black tea ones. I couldn't find chai spice, so I took the option of simmering some rooibos chai loose leaf in oat milk and then straining. I absolutely hate grating apple, so I just finely chopped it. I quartered this recipe to get one serving, and I used some dark agave to sweeten rather than making date paste. 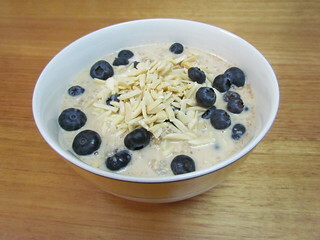 As well as oats and apples, it also has raw almonds in it for a protein boost. I soaked mine overnight for a quick breakfast the next day. I didn't find it too filling at first, but I felt full a bit later. Quinoa Berry Banana Bowls: I wasn't the biggest fan of the quinoa in this, it was all just a bit bland. 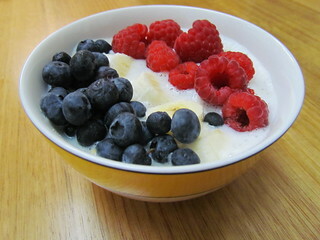 It uses pre-cooked quinoa, that is topped with milk, berries, bananas, and hemp seeds (which I forgot). I think it would be better if you had cooked the quinoa with some spices and sweetener to make it come together a bit more. 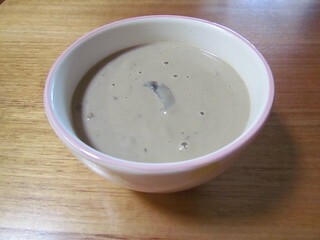 Cream of Mushroom Soup: This is an old favourite, and a great lunch. I made a half recipe, which gave me one good serve. It is made creamy with cashews, and nutritional yeast gives it a slight cheesy hint. Vegan sherry is very hard to find here, so I used some Chinese cooking wine instead. 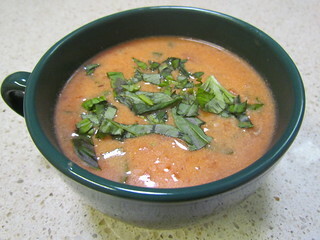 Tomato Basil Bisque: Another old favourite, but made a little fancy. It makes mug size servings, rather than big bowls, if you are following the four servings guide. It is not that filling, so definitely be sure to make a grilled cheese to go with it. 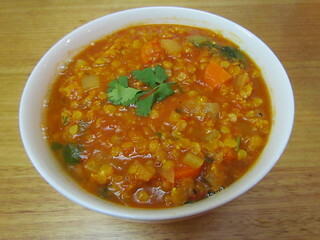 Moroccan Lentil Stew: I love lentil stew, but this one needs a few tweaks for my preferences. I found it overwhelmingly lemony, and not many of the other flavours came through. It makes a huge amount, so definitely go easy on the lemon! 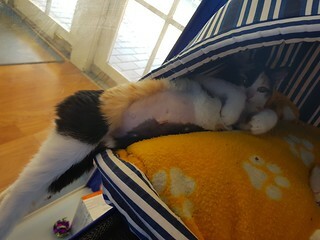 Here's a closer look at one of the kittens from the last post, being a very silly girl but really enjoying a good stretch out! I was lucky enough to win a copy of Taste For Life, a cookbook put out by Animals Australia in an Instagram competition. The only thing better than buying a new cookbook is winning one, am I right? The first part of the book is set up as an introduction to veganism, with some information on reasons for veganism, suggestions for getting started, very basic nutrition, some easy substitutes, eating out and converting familiar meal suggestions, as well as the basics of kitchen ingredients and equipment. It is a nice little overview, though does tend towards greatly simplifying some of the health benefits. But for those of us who are all up to speed, I am happy to report that the recipes included go far beyond just the basic standards of beginner vegan cookbooks (though there are lots of old favourites as well). I have made some truly lovely things, and I have many more marked. 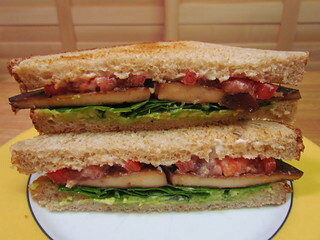 Ultimate TLTs with Avocado: I am a big fan of any sort of BLT variation, and this is a cracker. The bacon in this case is slabs of marinated and fried tofu. I cut mine a but too thick to really go crispy, but still so yummy. I served mine on regular bread, lightly toasted, rather than Turkish bread rolls. 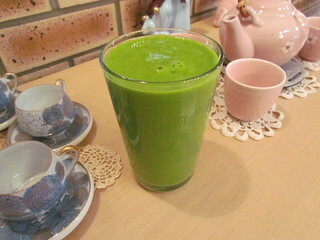 Passion for Greens Smoothie (Mango Variation): Of course all vegan cookbooks must have smoothies, and this has a page of suggestions. I made the mango variation of their green smoothie (the original version had passionfruit in it and I am just not a huge fan of passionfruit in smoothies). 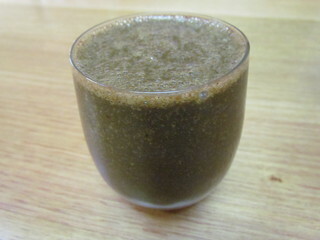 It is based on coconut water, making a nice refreshing and hydrating post yoga drink. Some ginger added to it would be nice. 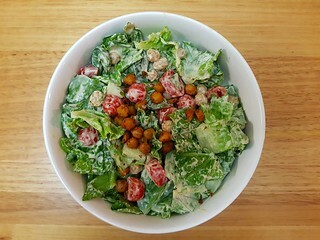 Caesar Salad with Herb-Roasted Chickpeas: First up, I made this with all cos lettuce and some baby spinach, rather than having kale in the mix. Raw kale, even when massaged, doesn't suit my tummy too well. Besides the salad ingredients, this recipe has two components - the dressing and the chickpeas. The dressing is based on cashews and include aquafaba (handily from the chickpeas you use for roasting), and is lovely. I used garlic powder rather than raw garlic. I also just blended all the ingredients together at once, rather than drizzling in the oil, and it was fine and very creamy. The chickpeas are roasted with a bevy of dried herbs and spices, and are so tasty. They do go a bit soft when folded through, so don't give the crunch of croutons, but the flavour is great. Chinese Mushroom Hotpot: I love mushrooms! I used a mix of oyster, shiitake, shimeji, and black fungus, as well as white mushrooms and some left over portobello stems that I sliced. I got three served of this, served over rice and some steamed spinach. The sauce includes hoisin sauce and five-spice powder, which are two of my favourite ingredients. 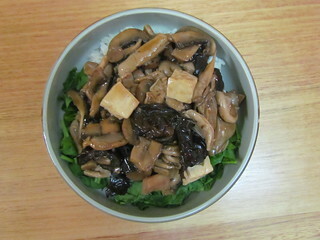 I added the optional silken tofu, which was a lovely addition. 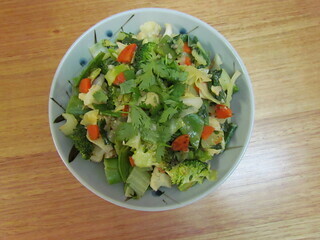 Vegie Stir-Fry with Coconut Red Curry Sauce: For my veggies I used cauliflower, carrot, broccoli, bok choy, green cabbage, and snot peas, but 100% left out the capsicum. 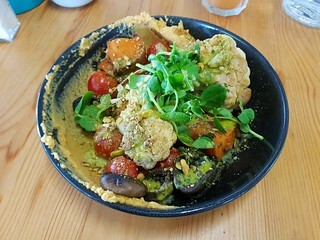 The sauce is based on pre-made red curry paste (there are a couple of vegan varieties in Australian supermarkets, I use Thai Gourmet), and was quite mild. I served this with jasmine rice, and got four serves. However, it wasn't super filling, so I would recommend adding some tofu or cashews. 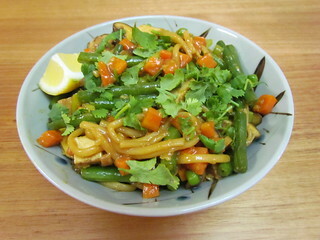 Curried Udon Noodles with Tofu: This was meant to be made with Hokkien noodles, but I had udon so I used them. This was delicious, with a mild curry sauce (I used 2 tsp of mild curry powder instead of 1 tablespoon) and a lot of soy sauce and mirin. 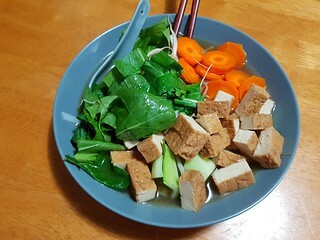 They suggest using either tofu puffs or a marinated tofu recipe from the book, I used my favourite quick and easy Soyco Japanese Marinated Tofu from the shops. I left out the capsicum, of course, but also the water chestnuts (I am not the biggest fan) and replaced them with some celery for the crunch. 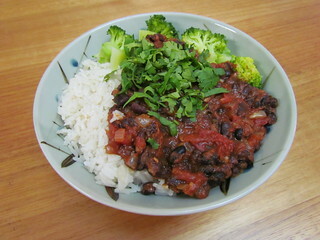 Smoky Southern Black Beans with Coconut Rice: Another wonderful meal! I scaled it down a little to use 1 and a 1/2 tins of black beans, rather than two whole cans, though I still used the full amount of tinned tomatoes. I also halved the amount of rice from 1 cup to 2 cups, and cooked it in my rice cooker with a combination of light coconut milk and water. This gave me about three serves. Really nice. 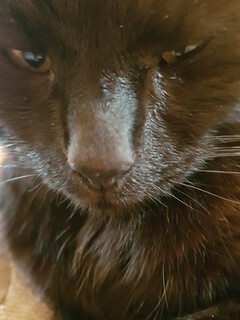 Dim Sim is suspicious of the close up camera! The second conference I went to was for Science Week, a three to four day vet conference held down at the Gold Coast. I attended two days, a feline masterclass day on the Wednesday and the feline stream on Thursday, the first day of the conference proper. Despite being near so much amazing vegan food, breaks weren't long enough so I had to rely on the conference. I should mention that any time I go to a conference, I am fully stocked with noodle cups, bananas, and snack bars. I take no risks in going hungry. Morning tea came around on the Wednesday and there was nothing marked vegan. Sigh. I found a catering person to ask, and was directed to something amazing. 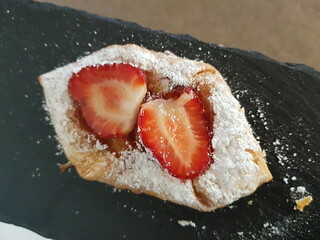 A strawberry danish! That was vegan! For some reason, instead of putting a vegan sign on them, they just put them on a black slate tray. Surrrrrre... Anyway, no complaints. Morning and afternoon tea were catered just to our small feline masterclass, but for lunch they sent us down to the main restaurant. Two years ago, at the same masterclass and the same venue, the vegan option was literally salad and fruit. 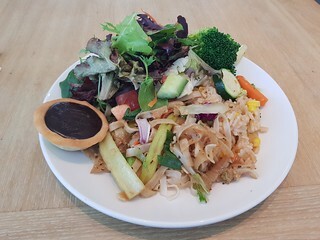 This day, I was directed to a designated area that had pad thai, fried rice, roasted vegetables, and the ubiquitous salad. Plus little vegan strawberry and chocolate tarts! I filled my plate, and went back for seconds on the pad thai and vegetables, plus a few more sneaky tarts. 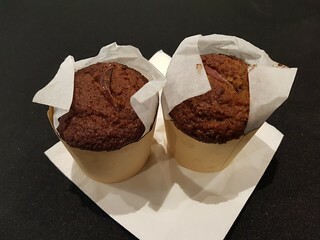 Afternoon tea was a couple of gorgeous apple muffins. I was so full from lunch, I only ate one. But took the other one home with me to freeze for a future work snack. On Thursday, the full conference had started, so morning and afternoon tea were on the main conference floor with a lot of people milling around. I was hopeful after Wednesday, and I was not disappointed. 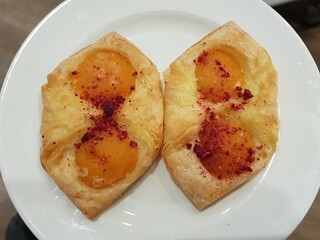 Apricot danishes! So great to see a venue realise that vegans love pastry, and that you can buy vegan pastry really easily, and make delicious morning teas for vegans! I 100% ate four of these. Lunch down at the restaurant was a little more disappointing this time, though still filling. 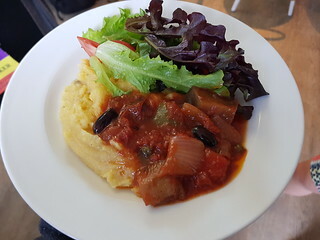 Vegan options were ratatouille (which was oddly spicy, and I had to carefully scoop around giant chunks of capsicum when serving myself), and some bland polenta. And salad, of course. Thankfully, they still had the chocolate strawberry tarts, as well as a lovely fruit plate, so I sugared up! Those chocolate strawberry tarts were soooooo good. Afternoon tea was a little confusing, as they had some things labelled and other things not labelled. 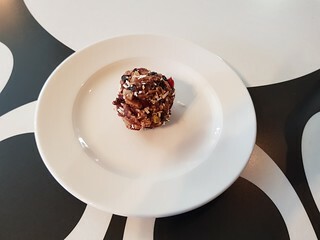 There were some savoury things that may have been vegan, but I contented myself with a little bliss ball. I didn't want to fill up too much, for reasons that will soon be apparent. Afterwards, on my drive home, I took advantage of being on the Gold Coast and stopped into Kuan Yin at Southport. 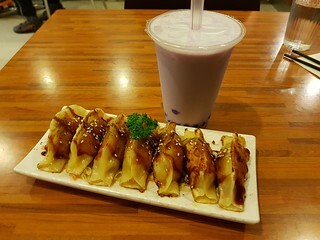 Kuan Yin used to have a restaurant in Fortitude Valley, which was one of my favourite places. But they closed and switched to a home delivery service, which was nice but not as good. But the Southport version continues to operate, with the same menu. Which meant it was time to order my favourites. 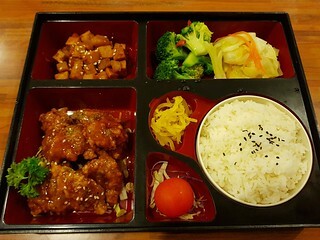 I had a standard order there - Taro Soy Milk Bubble Tea, Fried Dumplings, and Sweet & Sour Pork Bento. Normally I am not a sweet and sour fan, but theirs is so good. A proper, thick, sweet and sour sauce smeared on it, rather that the super sweet red sauce you see so often. Sometimes, I go to conferences. And as you know, vegan food at a conference can be pretty hit and miss... always take snacks! I have been to two conferences this year, with surprisingly reasonable vegan food! The first one I attended this year was a one day conference on veterinary palliative care. A cheery topic, but such an important one. Palliative and geriatric care, helping make end of life decisions, and helping animals on their way are not the most glamorous parts of veterinary medicine. But they are so crucial. 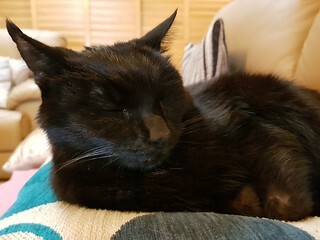 As someone who has not only helped many cats cross that rainbow bridge, but as someone who has said goodbye to my own cats, it is an area that really needs attention and care given to it. So anyway, FOOD. Right? That's what we are here for. It was a one day conference, with morning tea, lunch, and afternoon tea. 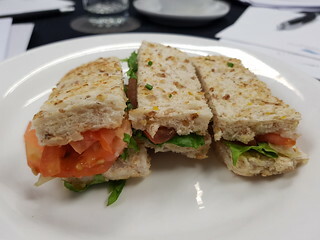 Remarkably, a few of the conference organisers themselves were vegan (it is so rare that I find any other vegans within the veterinary community! ), so they made sure we would be catered to. Morning tea for vegans was some nice little salad finger sandwiches. The bread had been lightly toasted, so they were nice and solid and hadn't gone soggy. At lunch, everything was vegan except for one flavour of wrap and the aioli. So I of course took some of everything... and then went back for some seconds. 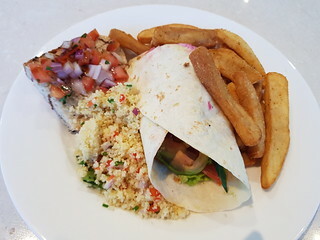 Bruschetta, cous cous salad, veggie wrap, and hot chips. Always give me hot potatoes! Afternoon tea had some non-vegan cakes, and some fruit platters. Yes, fruit is not the most inventive. Though I had eaten so much at lunch that I was glad for a lighter, fruitier snack! After the conference I went to my friend Amy's house and she made us some delicious vegan pho. Also this amazing dessert that was called chocolate crack and was something involving salty crackers and melted chocolate and it was aptly named. I know I will always have great food and good company (plus cute cats) at Amy's. 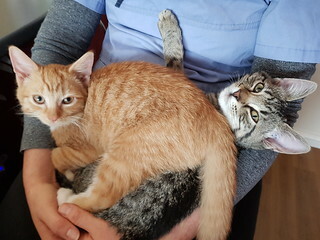 Gumdrop and Layla were another two of our recent adoption kittens. They both got a home together! This is my first round-up for Superfoods 24/7 by Jessica Nadel. Honestly, I don't really buy into the whole superfoods thing. They seem to chop and change and at some point almost everything is a superfood in some way. But this book has a fun, healthy slant that I enjoy. Plus is you know me, you know I love using silly ingredients! Though most of this book is pretty accessible to make, with not that many hard to find ingredients, which is nice. See, all food is super! 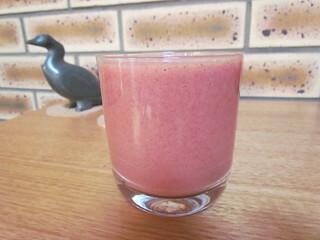 Pretty In Pink Strawberry Hemp Smoothie: This is a mix of strawberries, peaches, hemp, and liquid (I used oat milk). I used both frozen peaches and frozen strawberries, so mine ended up being super thick. 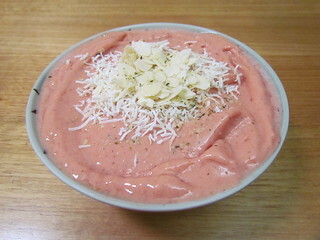 Too thick to drink out of a glass, so I turned it into a smoothie bowl and topped it with some coconut, flaked almonds, and more hemp seed. Sweet, and definitely a pretty pink. Citrus Chia Pom Smoothie: This is based on orange juice and pomegranate, but thanks to a frozen banana in the mix it was not too citrusy for my stomach. 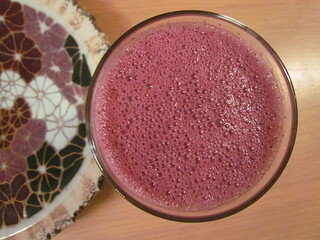 I used the option of pomegranate juice and frozen raspberries, rather than pomegranate arils. It also has some chia seeds in the mix, to help thicked it up a bit. Blissful Blueberry Oatmeal Smoothie: Oats, blueberries, yoghurt, and non-dairy milk make this like overnight oats in a smoothie. It was nice, but I would decrease the amount of milk called for (I used oat milk) as it ended up being a bit on the thin side. I like my smoothies thick. Blueberry Chia Overnight Oats: This is one filling breakfast. It says it serves two, but normally that means it just serves me. So I made the full amount, but ended up having to leave a bit over for a snack. Oats, chia, and maca powder are the base. I served mine topped with more blueberries and some almonds. Apple, Beetroot, Broccoli Slaw: When life gifts you with yellow beets... I hardly ever see them here, so when I cam across one I scaled this recipe down for one serve to use my precious beet. 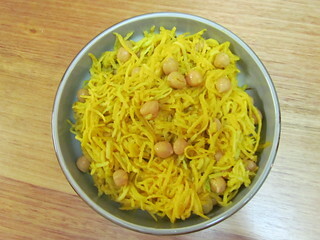 The salad is a mix of shredded yellow beet, broccoli stalk, Granny Smith apples, and chickpeas. It has a lovely, creamy turmeric dressing on top. I served this with some roasted broccoli florets, a sauteed veggie sausage, and some avocado toast for a lovely dinner. 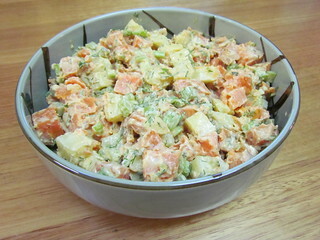 Picnic Sweet Potato Salad: A lovely salad using a blend of sweet and regular potatoes, as well as some diced celery for crunch. Plenty of dill and pickles (I didn't have a dill pickle or dill pickle juice at the time, so I just used some gherkin relish and added extra flesh dill), and a creamy mayo-based dressing. I left out the raw onions, as they do not agree with me. 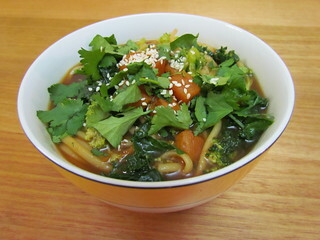 Udon Soup with Broccolim Kale, and Sweet Potato: This warming wintery soup gave three dinner sized servings. It has a lovely broth, with soy and sesame oil. I used 270g dry udon noodles, rather than 400g of fresh, and I added them in to cook for 10 minutes. I also added a bit of extra kale. 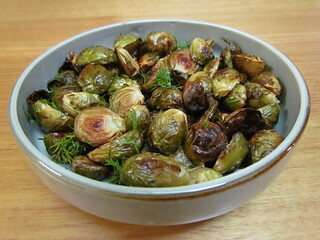 Crispy Roasted Brussels Sprouts with Fresh Herbs: I love Brussels sprouts most ways, but roasting is definitely my favourite. I used 400g of small sprouts for this to make 2 side serves. Once roasted, they are tossed with fresh herbs. You can take your pick, I chose some fresh dill. 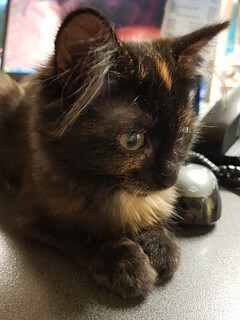 Because of MoFo themes, I haven't had much of a chance to share our latest bunch of adoption kittens. 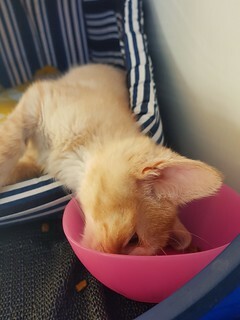 I am happy to say that they all have homes now, but they are super cute, so you should enjoy their photos. This is Freckles, check out her amazing ear floof! Hello, and welcome to a post MoFo world. I am looking forward to easing back into regular blogging life and frequency. Which is to say, as I feel like it. But I still have lots of content to share, and I am continually adding to it. I need to keep on eating, after all! 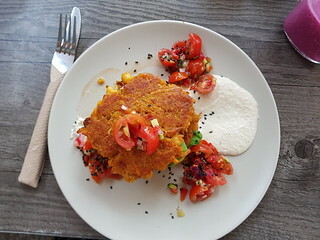 Today's post is two restaurants that I visited out of interest. I always like visiting when there is a vegan option. For different reasons, I won't be hurrying back to either. So I figured they'd do well to share a post. I visited this place one day post yoga, as it is just a few minutes walk from my studio and I'd seen some people recommend it on Instagram. Their vegan options are pretty standard - avocado toast variation, acia bowl, chia coconut pudding, and a bowl. I got the bowl, which had an assortment of roasted vegetables and hummus. It looks like they have changed the contents according to their current menu. It was a nice bowl, with nice flavours. But I really needed some bread or something a bit more carby and solid with it, or a bit more protein, as it didn't really fill me up. 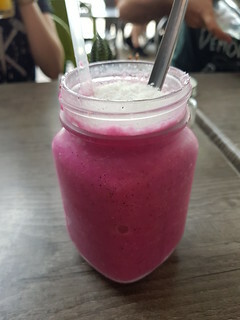 I also had a strawberry, apple, and mint juice. If your non-vegan friends suggest going here, you know that you have some options. But nothing that would jump out at me to go back again. I'm not in a rush to go back here for a different reason. This place is only about five minutes walk from one of our clinics, so I thought I'd give it a try and duck out to grab lunch one day when I was working there. Alas, there was no ducking out about it. I waited for 40 minutes for my food to arrive after ordering! I was so stressed, I was about to cancel my order and leave as I had to get back to the clinic, but then it came. I know somedays kitchens run more behind than others, and I'm normally willing to give them the benefit of the doubt. But I'm afraid to say all that waiting and I was severely underwhelmed by my Kickstarter Bowl. 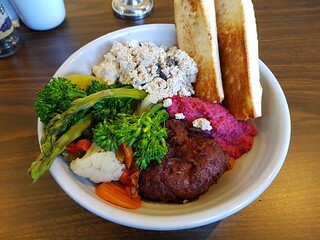 It claimed to have tofu scramble, citrus kale, winter vegetables, pickles, a pakora, and beetroot hummus, and I ordered a baguette on the side. The scramble was basically just salt and pepper on soggy tofu, the vegetables were soggy steamed broccolini and asparagus, barely any kale, a lukewarm pakora.... the hummus was OK but not really beetroot flavoured. The pickles were the best bit. And the baguette. 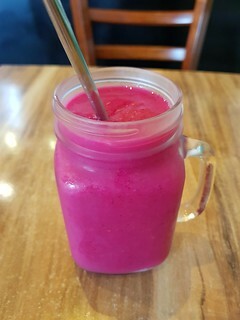 I also got a Coral Trout juice, which had carrot, apple and ginger juice with frozen beetroot juice cubes. 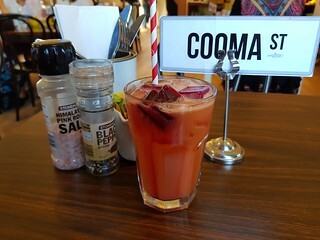 They do have some other vegan options (again, avocado toast, a burger, bircher muesli, a mushroom burger), and I have heard better reports about it than mine. But given that there are so many other amazing vegan friendly places in the area, I'd rather go somewhere that I know will satisfy. After a month of having to share photos with other cats on the blog, Dim Sim would like to remind you of her preferred state. 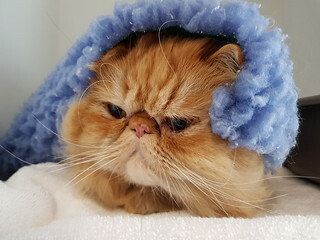 The only cat.